Do you love surprises? I have to say that I love giving surprises more than receiving them. Over the years I learned to loosen up a little bit (good surprise, bad surprise, come my way!) and I’m so glad that I’ve come to love surprises, because our trip to Slovakia was definitely unexpected! 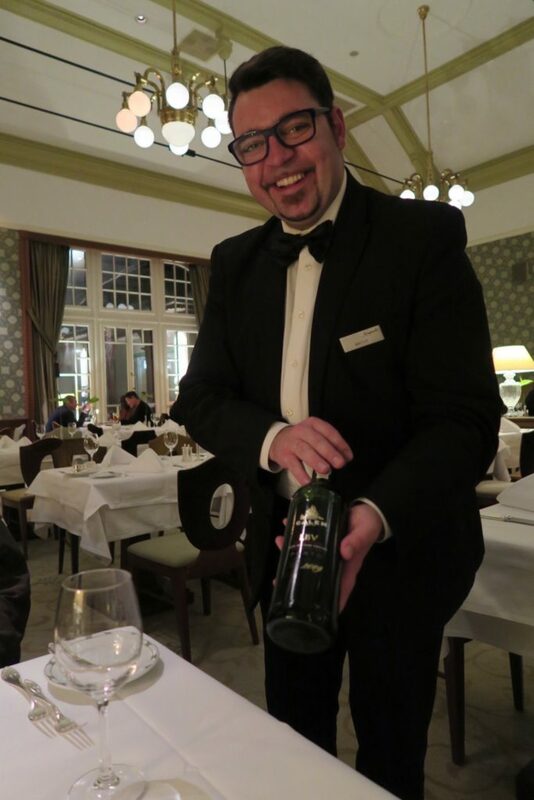 If you’ve been reading my previous posts about Europe, then you’d know that we travelled and explored Central Europe with JayWay Boutique Travel, a company that specialises in private tours around Central and Eastern Europe. And JayWay Travel takes private tours and personal service to a different level. And by that, I mean they really get to know you and your travel personality thoroughly first before even making suggestions and recommnedations. So when JayWay Travel told me that they have a ‘surprise destination’ for us, I took a deep breath. Usually, when someone tells me “I’ve a surprise for you!” I would bug them to no end. But because the JayWay Travel team and I have been in touch building my European trip for several weeks before departure, I knew that they knew me and my travel style well enough so I took the ‘backseat’ and happily did a little dance when they later revealed we will be going to Slovakia! From Budapest, we were picked up by our private transfer car arranged by JayWay Travel to High Tatras in Slovakia. The drive took about 4 hours but we were very warm and comfortable in the car. It was already cold in Budapest, but as we drove to High Tatras, snow was everywhere! 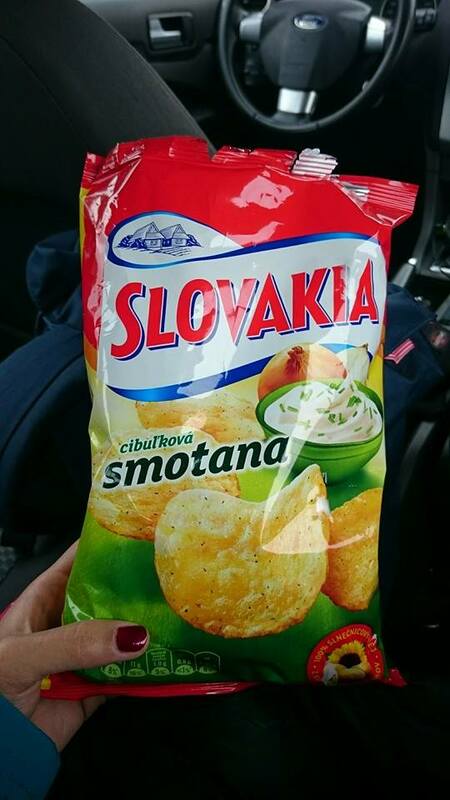 These were, in my opinion, the best tasting pack of chips in Central / Eastern Europe! Got them during a petrol break after crossing the Slovakian border. The winding roads soon became narrower and more uphill. Gradually, we were taken from autumn weather to the middle of winter! High Tatras is a popular ski and winter sports destination in the Northern Slovakian region (and southern Poland region). 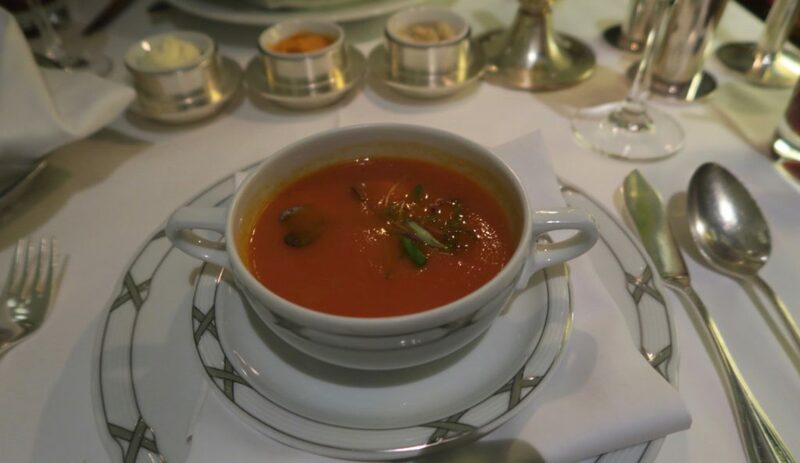 It is frequented by a lot of European travellers. And though it wasn’t quite ski season yet when we arrived, we were lucky to see it in full snow (snow only started the day before we arrived). The fog seemed to lift just in time for us to see the facade of the Grand Hotel Kempinski High Tatras, our accommodation in Slovakia. Inside, it was very warm and toasty and they even had the fire on. Everyone was excited and commenting on how snow came surprisingly early this year and that the hotel staff weren’t expecting to start the fire this early on in the year (October). The hotel has a very interesting history. Overall, there are three interconnecting buildings that make up the entire hotel. 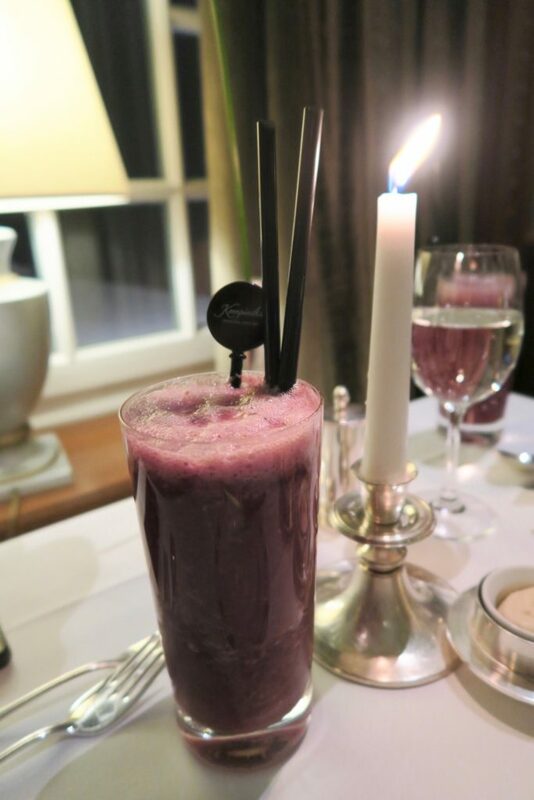 The oldest of the buildings, dating back to 1893, used to be a romantic small villa that was frequented by the highest levels of aristocracy back in the day. Regular guests of the villa included Eastern and Central Royal Families. Over time, two other buildings have been added and connected to the orignal one, with the second being completed in 1906 and the latest in 1923. 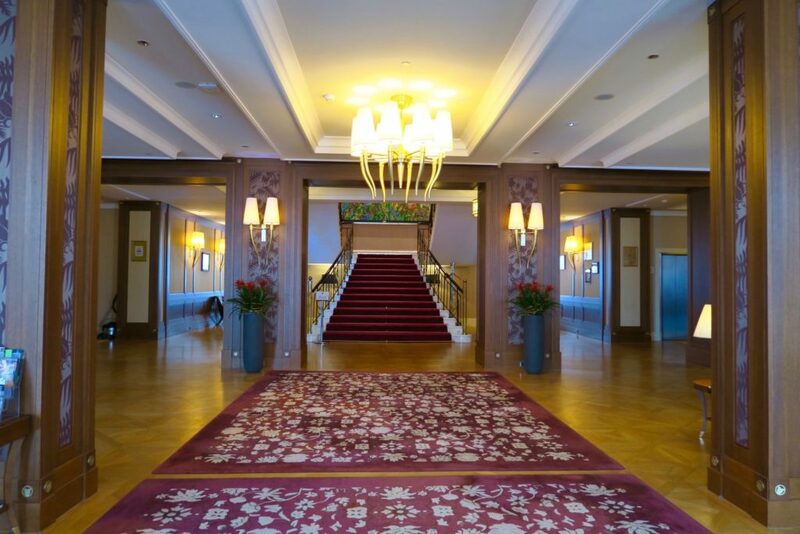 From 1923 to the early 1950’s the buildings operated as “Grand Hotel Hviezdoslav” . And then in 1953, the hotel became a sanotorium and it eventually closed due to deteriorating condition. In 2003, a big project took place to transform the historically protected buildings into a luxury hotel. 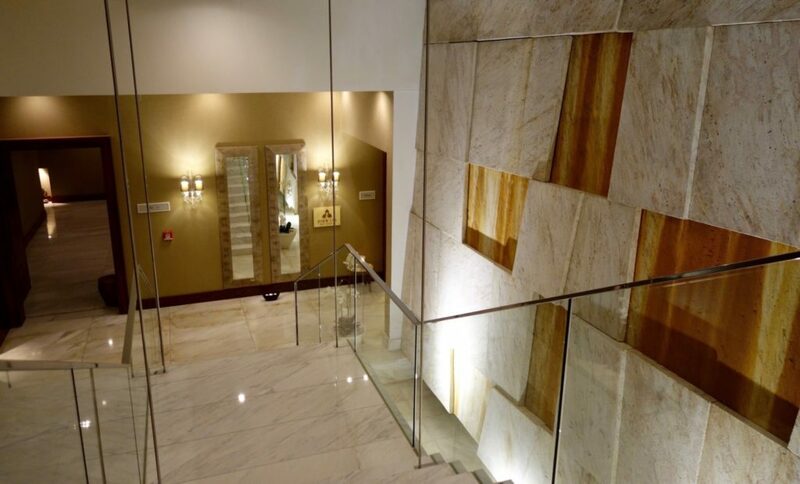 This undertaking was spearheaded by architect Peter Cerno and Kempinski. 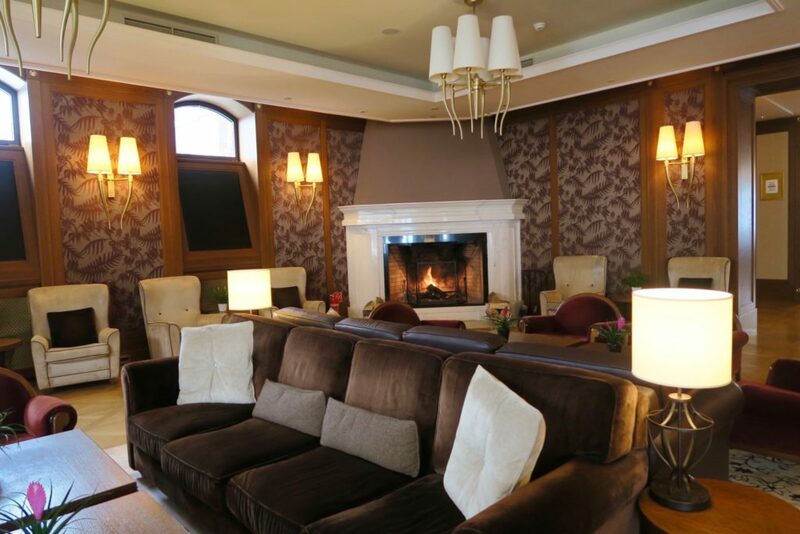 Kempinski was very careful to keep the interiors as close to the original as possible. 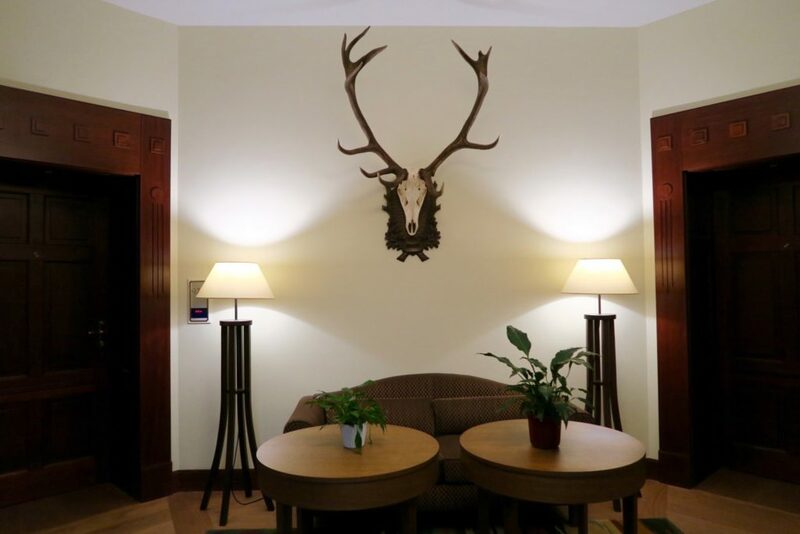 Lots of natural wood are incorporated in the decor with a mix of a hunting lodge feel in certain parts of the hotel. I’d never been so excited to explore a hotel before. It was heavily fogged up outside so my agenda was to explore every nook and cranny of the hotel. 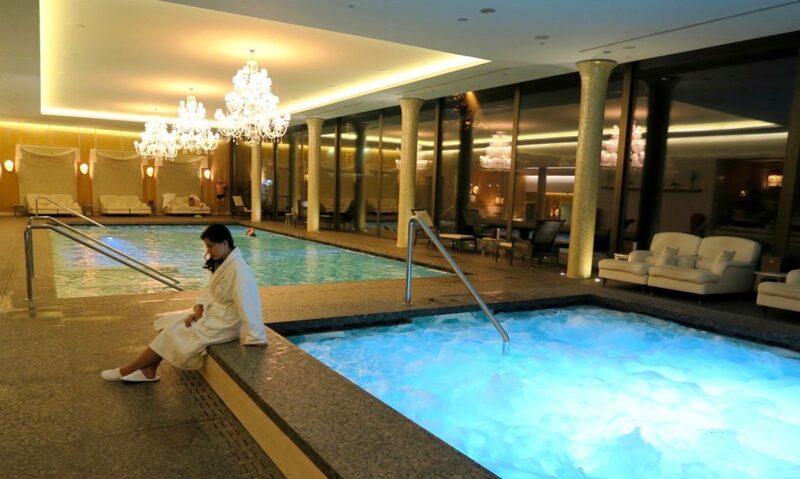 It can take one hours or even half a day just to tour the inside of the hotel. 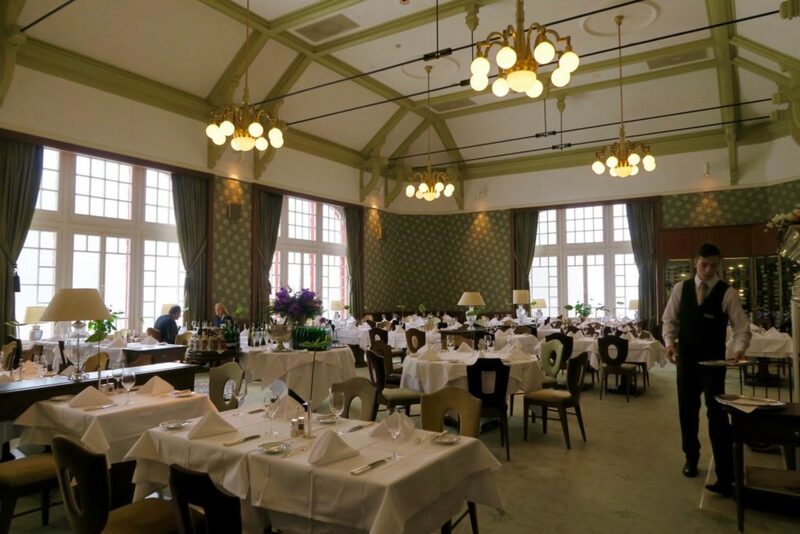 Uneven passageways, stairways in unexpected places – it was exciting to discover how they kept the original decor and layout of the hotel while still having that Kempinski touch of luxury. 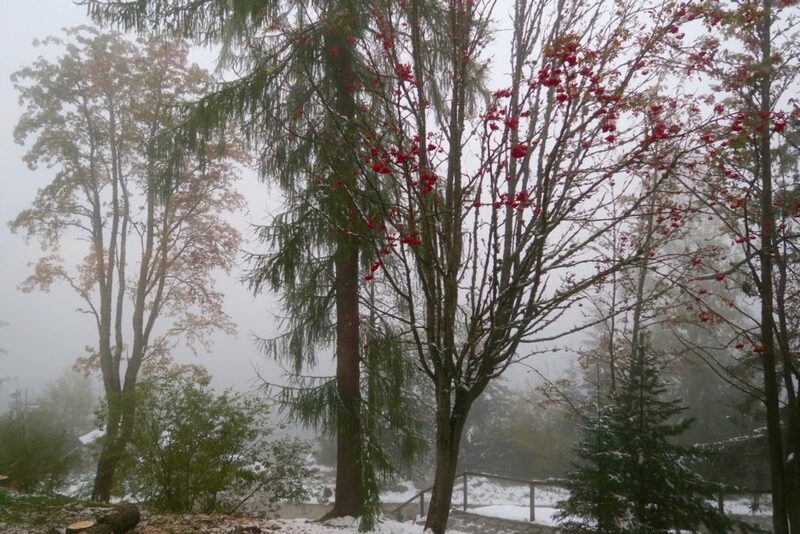 Snow came early in High Tatras! 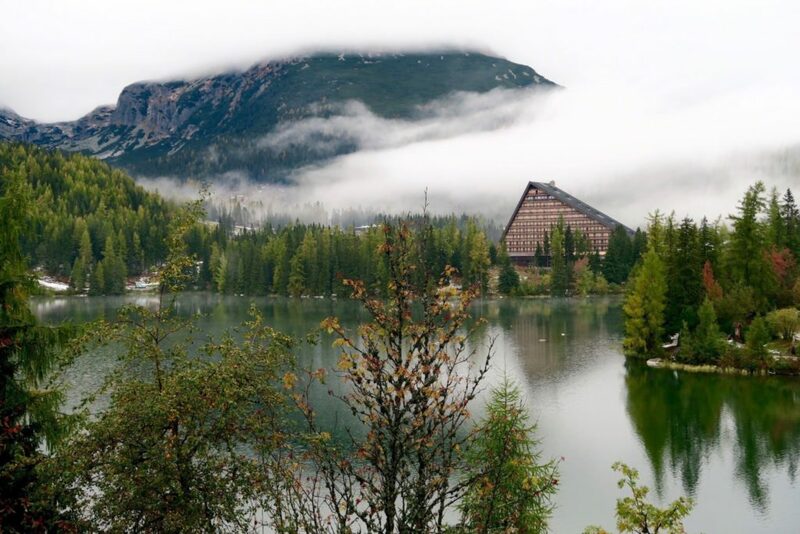 The hotel is in a picturesque location with Lake Strbske pleso right by its backyard. Because it was snowing and heavily fogged up, I didn’t get to see much of the view on my first day but was rewarded by a magnificent view the next day when the sun decided to shine (photo at the end of this post). Nevertheless, I found that there’s more than enough things to keep one entertained inside the hotel , apart from exploring it’s different rooms and annexes. First of all, this pool. THIS. POOL. I’d never seen any pool more inviting. 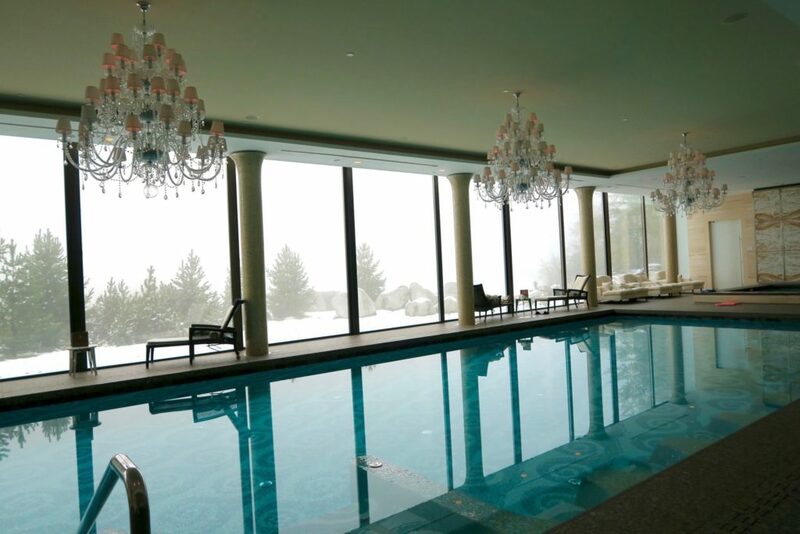 This heated pool with chandeliers (three, no less!) is the perfect “I’m-so-glad-I’m-not-out-there” cocoon given the freezing outside conditions! 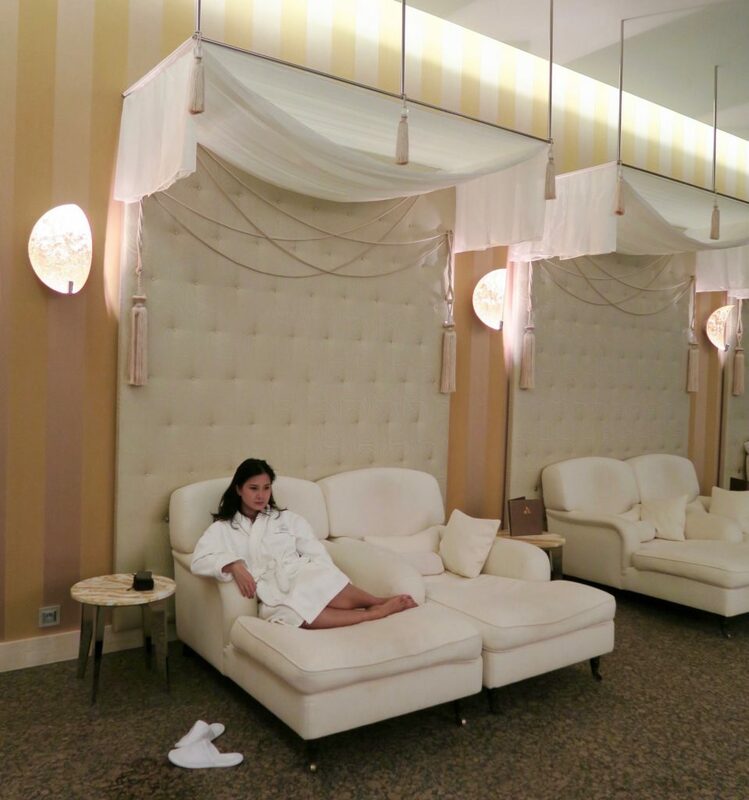 Stepping into the Zion Spa was like being transported into an entirely different world. It’s completely different from the rest of the hotel in that it has such a modern feel and design. I had a 60 minute aromatherapy massage using Frankincense which was beautifully musky. I also had a blissful head massage at the end of the treatment. So you cannot blame me for being in a drunkenly blissed-out state at the end of the massage. NOSPLAGLIA: That aftermath hour after a heavenly spa treatment and you lay in a drunken spa stupor, hair all oiled up, face puffy from sleep and bliss. 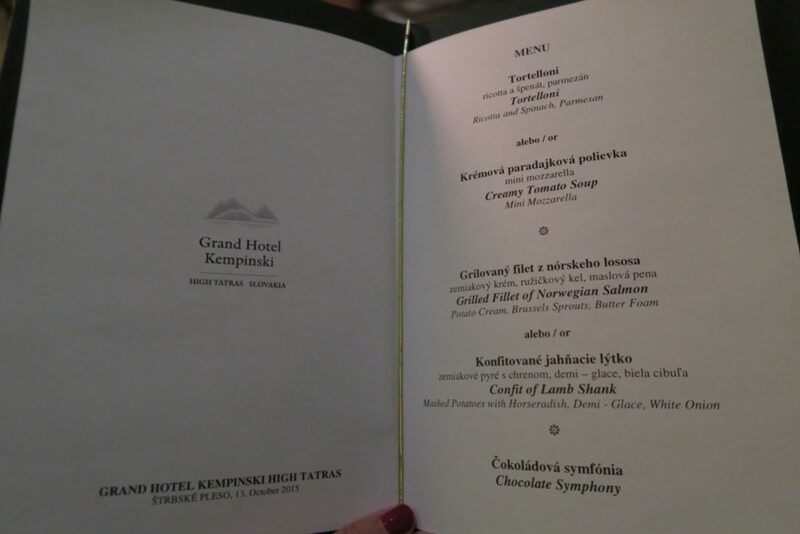 The Kempinski Hotel High Tatras is quite isolated but you are in good hands when having most of your meals at The Grand Restaurant. 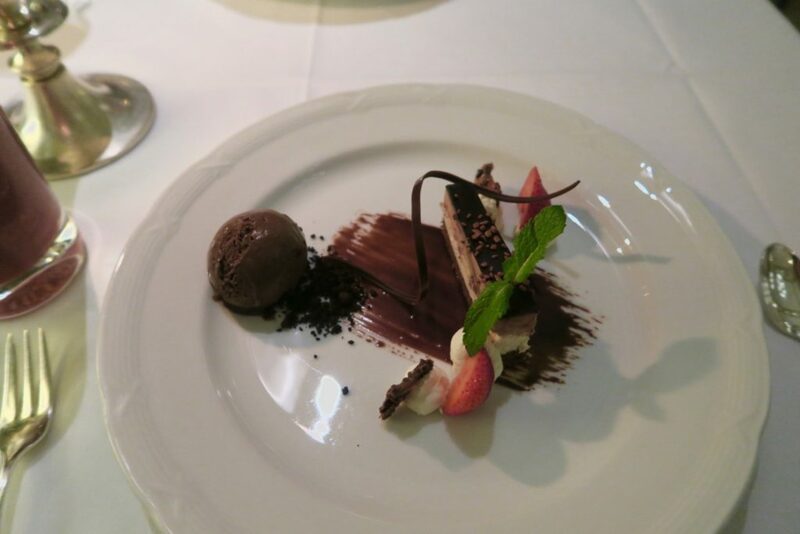 I enjoyed all courses of the dinner (along with my main choice of grilled fillet of Norweigian Salmon), it was the most perfect way to end the day after such an indulgent afternoon in High Tatras! Alright, lest you think I just lived a sloth’s life in High Tatras, I’d like to show you my favourite rooms within the hotel. We stayed at the Junior Suite category, but I enjoyed looking at the other rooms so much, I thought it was worth showing you. I love the colour scheme of the suite. 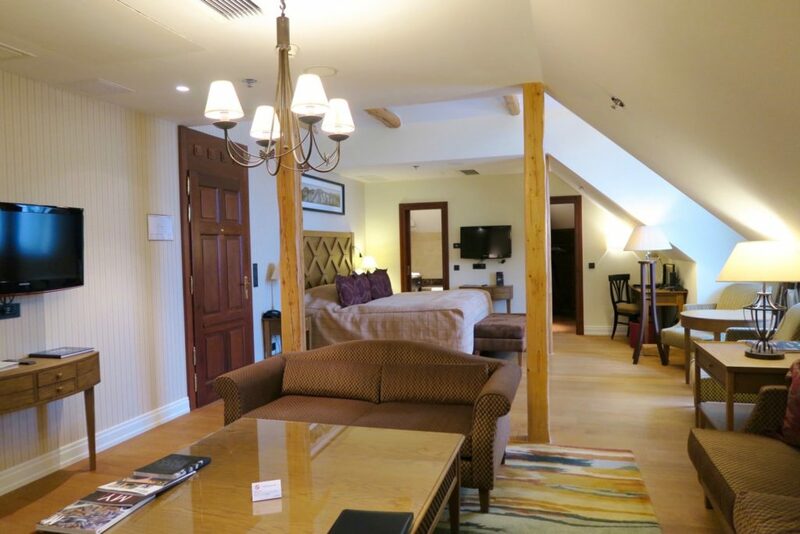 This suite has the most different look among the other rooms and suites of the hotel. This suite has a very luxurious 90’s feel to it. 90’s decor has to be done perfectly right as it can easily look tacky but this one has all the right elements. I loved the unusual layout of it, with that humongous staircase in the middle of it all (which leads to a private rooftop jacuzzi). 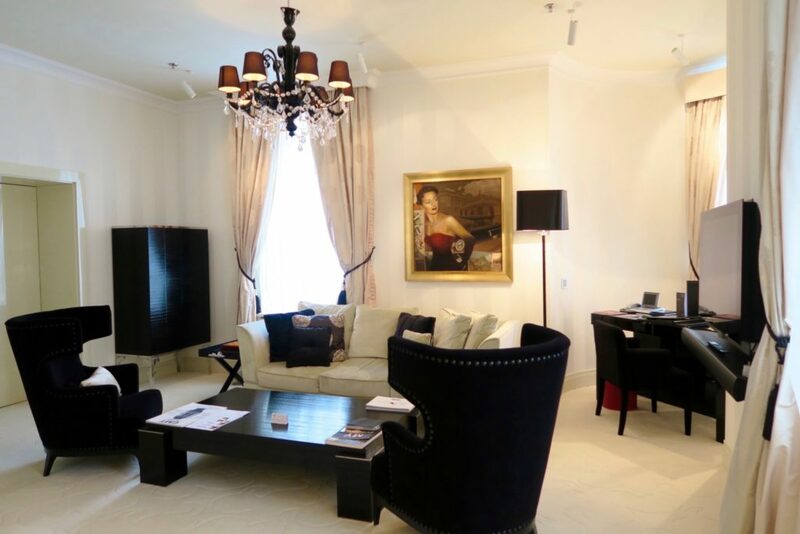 And then there’s the Presidential Suite, which consists of 2 suites that are connected by a common dining room. 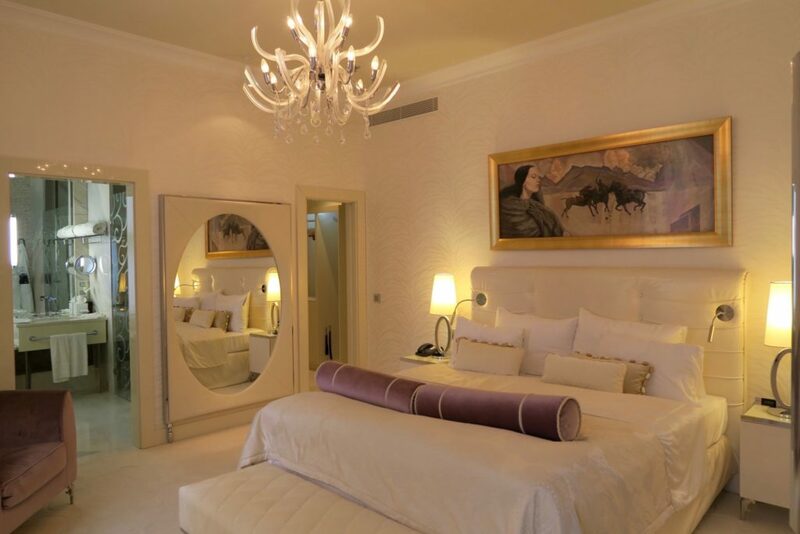 This is one of the bedrooms of the Presidential Suite. They Presidential Suites have a very glam-2o’s, almost Gatsby-ish style but more plush. I also love the paintings of women with elements of High Tatras (such as the horses, the mountains and lake on the painting above). Living area of the second suite, which has a more ‘masculine’ theme (by way of black accents). 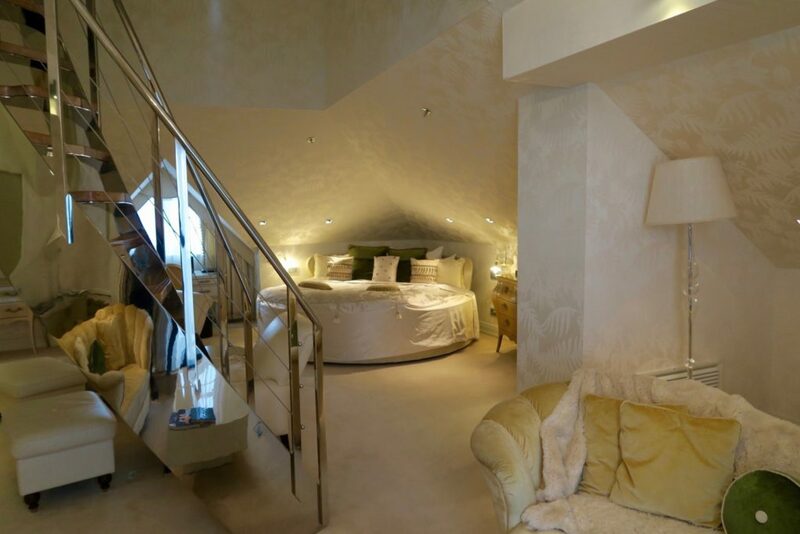 Now here’s another close favourite of mine, the Deluxe Suite. I’m in love with the wooden beams and the fact that those beams were part of the original structure of the building, back when it was a lodge/ villa for the royal families, impressed me even more. The heated floors of the bathroom were such a big bonus. 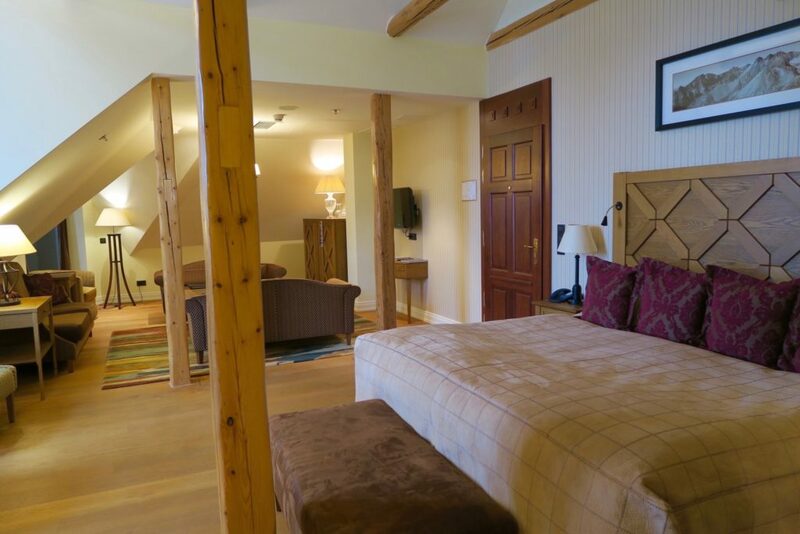 The best feature of the Junior Suite is that it overlooks the lake. As I earlier mentioned, we didn’t really get to see much on our first day as the fog was just too thick. But the very next morning, we were pleasantly surprised (again!) when the sun came out and saw this right outside the window. I may have been so lucky to see that magical view, but I can honestly say that even if it was fogged up the entire time, I still would have enjoyed my stay at the Kempinski High Tatras. The history of the hotel and its buildings, along with the very well thought-of room decors and styles were impressive. 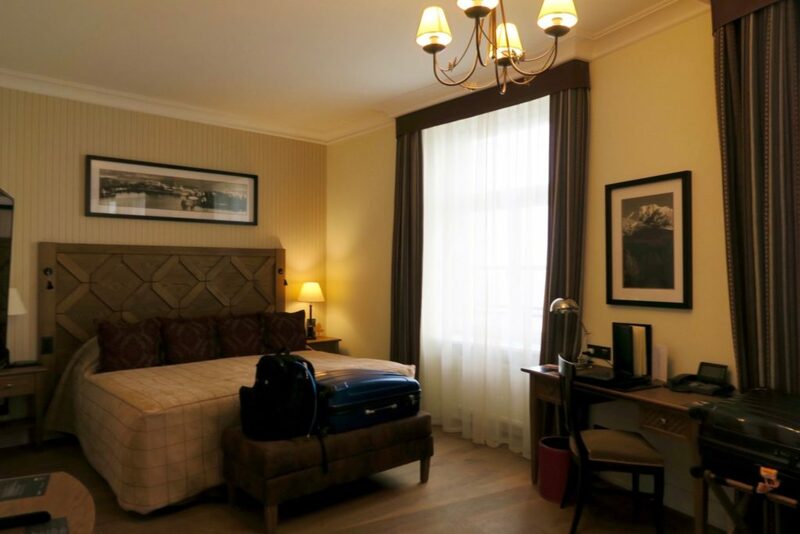 It’s rare to see a hotel with this much variation in its room styles so it was impressive to see it especially from the luxurious Kempinski brand. Because picutres are never enough! Here’s a hotel tour featuring the rooms I mentioned above. Now I’d love to know, do you love surprises? 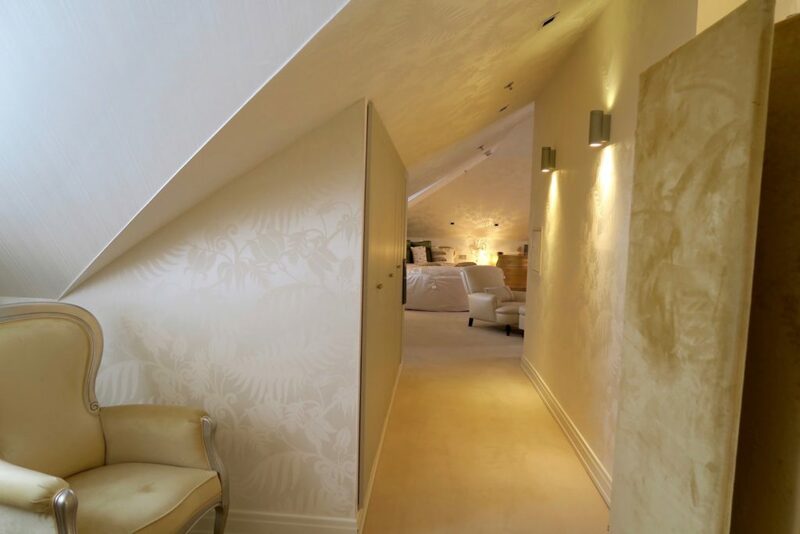 And which of the above rooms would you pick? 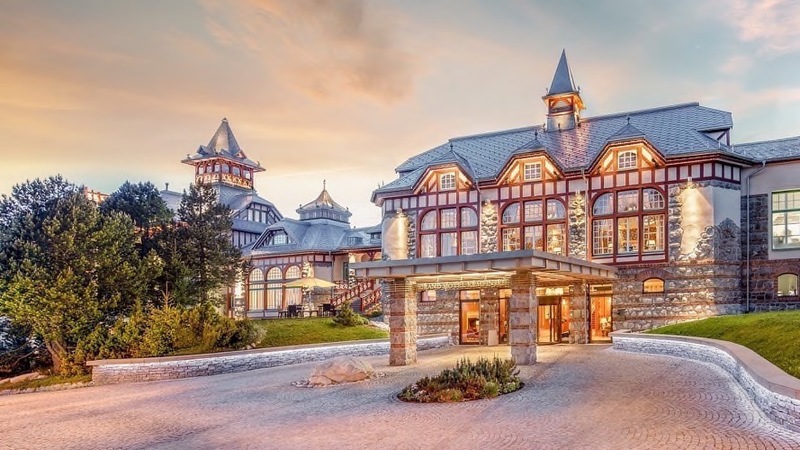 We were guests of the The Kempinski Grand Hotel High Tatras as part of a custom tour arranged by JayWay Travel, private tour specialists in Central and Eastern Europe travel. There is no obligation for a favourable review, all thoughts and opinions are solely mine. 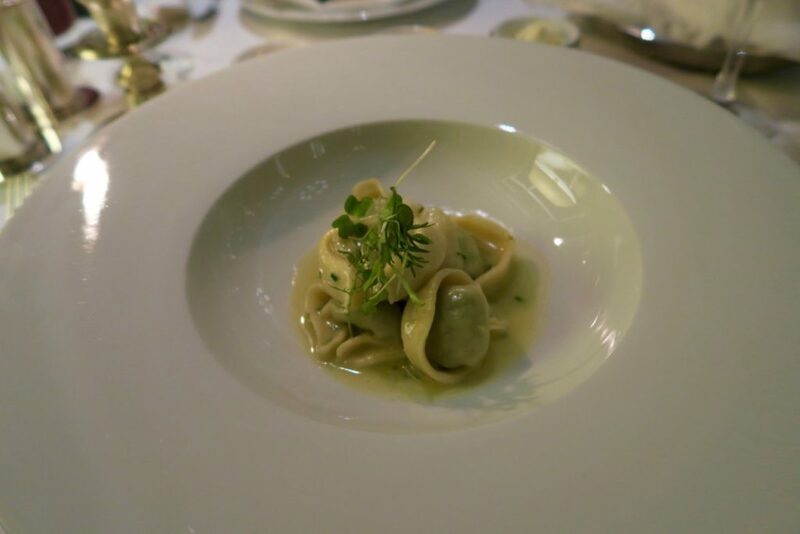 My little experience of Kempinski hotels has been very impressive. We stayed in one in Jordan and I adored it although it was quite different from this in that it was really modern. This is pretty much a perfect day for me! The hotel looks like it’s out of a fairy tale and how nice to visit it with the snow!